The building was constructed in 1893 and designed by architect, Axel Kumlien who in the year of 1886 traveled to Luleå, Piteå and Skellefteå to find a suitable place to build on. When the medical board decided to build a hospital in the northern part of Sweden there were many conditions that needed to be sustained. The prospective hospital would have a central location for both Norrbotten and Västerbotten, well-functioning transportation links as well by land and at sea. There had to be good and cheap supply for food. Plenty of water and sufficient water was also a requirement. The building ground had to be good and sheltered from northern and southern winds. After careful considerations they found such place on the island Pitholmen, two kilometers from Piteå city. During the inauguration of Furunäset hospital it was considered to be the most magnificent building in the northern part of Sweden. All the fantastic conditions were fulfilled, the central and windproof location, good transportation connections and finally good food and water for everyone. 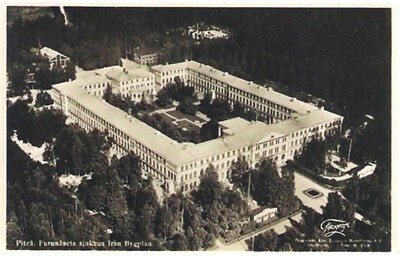 In 1987, the property housed a hotel and conference and a business park with then about 70 companies and 550 employees. 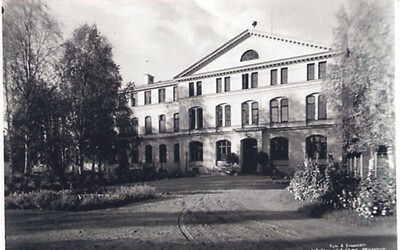 Furunäset Hospital 1893 – 1994. It was the 20th of October 1893 as the steamer “Rurik” added at a newly built harbor in Piteå River. There was not an unusual sight for the people who lived in Piteå to see the steamers park at the dock filled with cargo this time of year. 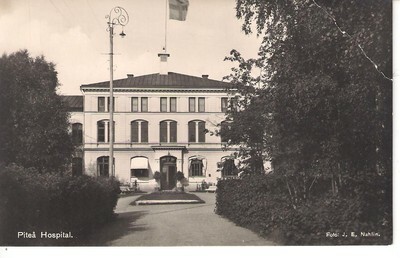 The unusual thing about this time was that the steamer was filled with 74 men who were received by uniformed staff to take them to Furunäset Hospital. A week later it arrived the same amount of women to the same harbor, with the same conditions. The people who came to Furunäset Hospital were called “insane” and they came from overcrowded hospitals around Sweden. With this new hospital and these patients, the modern mental health care had established in the northernmost part of Sweden. Many of the patients spent most of their adult life in the hospital area and their memories and experiences of the place are off course different. Furunäsets history contains both bright and dark stories. Stories that is equally true and equally important to narrate and remember.